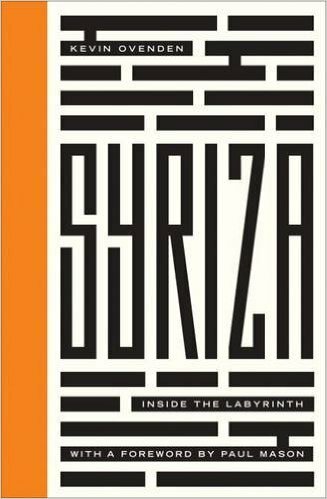 In Syriza: Inside the Labyrinth, the first book to be published as part of the relaunched Left Book Club, Kevin Ovenden gives an on-the-ground account of Syriza’s rise to power following the party’s election victory in Greece in January 2015. By tracing the heavy compromises and strategic decisions made by the party during its defining first six months in office, Ovenden’s book not only captures the complexity of recent Greek politics, but also speaks to the question of whether radical change can be mobilised on both the streets and through the ballot box, writes Nicolas Schneider. Syriza: Inside the Labyrinth. Kevin Ovenden. Pluto Press (Left Book Club). 2015. The election victory of Syriza in Greece rocked political Europe in January 2015. A party that had repeatedly – and credibly – asserted its association with left social movements, had underlined its unwillingness to collaborate with any of the established parties and, simultaneously, had voiced its opposition to globalised capitalism, prepared to take the reins of a venerable member of the European Union and the eurozone. Membership of the monetary union had brought Greece to the centre of European public attention since the onset of the financial crisis in 2008, which triggered the breakdown of the Greek two-party system in place since the fall of the military junta in 1974. Kevin Ovenden’s new book Syriza: Inside the Labyrinth retraces Syriza’s emergence and rise to power as well as the Syriza-led government’s first, decisive six months in office. The book provides a deeply insightful account of both the social and political conditions that enabled the electoral success of Syriza and of the negotiations with the troika during the first half of 2015. Ovenden is a well-versed and highly sympathetic observer, who nonetheless provides a witty and unsparing analysis of the failures and strategic mistakes that served to – at least initially – halt Syriza’s propulsion. Ovenden’s account reflects more than thirty years of immersion in the Greek political scene, both as a left-wing activist and as a journalist. This finds expression in the numerous first-hand accounts provided throughout the book, giving voice to people actively engaged in the movements. In the broader context of anti-austerity movements arising across Europe in the last decade in protest at neoliberal politics, seen as increasingly disdainful vis-à-vis public interest, Ovenden seeks to illuminate what he conceives of as an attempt at a ‘radical break from the old’ (20). Thus starting out with Chapter One, ‘Between Things Ended and Things Begun’, the book takes up its analysis of the success and failure of Syriza by way of the familiar left-wing debates on whether change should be sought from within the liberal state, by the help of a left-wing political party, or from without, as a subversive social movement. Against this backdrop, Ovenden traces ‘The Resisted Rise of Syriza’ (Chapter Two), out of a movement at odds with both the Pasok/New Democracy ‘ancien regime’ (21) and the orthodox communists. Becoming a unitary party only in 2013, the Syriza coalition was first founded in 2004, emerging out of a range of fragmentations occurring on the left of the Greek political spectrum during the early 1990s. In tracing this formation of a comprehensive left movement, Ovenden observes a crystallisation of the class conflict between ‘the downtrodden’ and ‘their tormentors’ (155), which translates the high degree of politicisation of the Greek people in the face of its ever-growing alienation from the political establishment. The book analyses in great detail how the political establishment tried to fend off the rising power. Though finger-pointing at the European and Greek ‘elites’ one too many times, it convincingly illustrates how recourse to xenophobic and anti-communist discourses played an integral role in this strategy of fear-mongering and scapegoating. One infamous example of this is ‘Operation Hospitable Zeus’, launched in 2012 by the Samaras government, which saw racialised raids in Greek cities and the unwarranted detention of asylum-seekers in so-called ‘hospitality centres’ (80-86). The book also shows how the stability of European political systems feeds on the ‘silent majority’: a figure that has frequently been summoned to stifle social movements, but which reaches its limits once this majority itself takes to the street. The sweeping mobilisation of Greek citizens made possible the victory of Syriza in the first place. However, in the course of the first few months in office, Syriza’s fundamental impotence became manifest, faced with both the external demands imposed by the EU and the ‘deep state’ structures that undermined attempts at reform from within. Ovenden exposes how vulnerability to those pressures was exacerbated by the lack of orientation and resolve on the part of Syriza itself. This is most clearly reflected in its riding roughshod over the results of a referendum called in July, in which the majority of Greeks rejected the troika’s demands. It is here that the book focuses on Prime Minister Alexis Tsipras, whose ‘turn against the left’ (171) epitomises the failure of the Syriza government to find a solution to a dilemma in which it found itself entangled. This dilemma boils down to the apparently impossible reconciliation of an explicit internationalism with a unilateral exit from the common currency. The ‘Grexit’ spectre appeared as the last option to avoid the creditors’ demands, yet this would have meant the isolation of Greece on the international level as well as the violation of its internationalist principles. The ensuing cracks in the coalition between the political party and the social movement backing it reveal the pitfalls of engaging in a political system for those who demand far-reaching changes to the system itself. However, this development also sheds light on a painful truth pointed out by Tsipras, lashing out at his critics: ‘what is your governmental alternative?’ (174) – between playing the political game and refraining from state power tout court, the Greek attempt at achieving a radical break from the old was caught between a rock and a hard place from the outset. Ovenden’s book, the expressed aim of which is to contribute to learning from this ‘bitter experience’ (177), acknowledges this deadlock, which frustrates emancipatory social movements whenever it comes to actively participating in the entrenched political system. In a recent contribution to The Brooklyn Rail, Jason E. Smith strikes a much more sombre note. Linking the venture into party politics with Friedrich Nietzsche’s famous quote invoking the hazardous effects of staring too long into an abyss, Smith brushes aside any effort at translating social movements into political parties, contending that ‘far from giving [those movements] a political articulation, the emergence of electoral machines like Syriza was premised on the withering away of these movements’. For Smith, in contrast to Ovenden, parties like Syriza do not signify the crystallisation of class antagonisms, but rather the very decline of the popular mobilisations from which they emanate. Notwithstanding, or precisely because of this profound dissent, Ovenden’s Syriza is a valuable and instructive contribution to the debate on the future of the left. Nicolas Schneider graduated from LSE’s European Institute with a MSc in European Studies in 2014. He is currently based in Berlin, writing and translating.